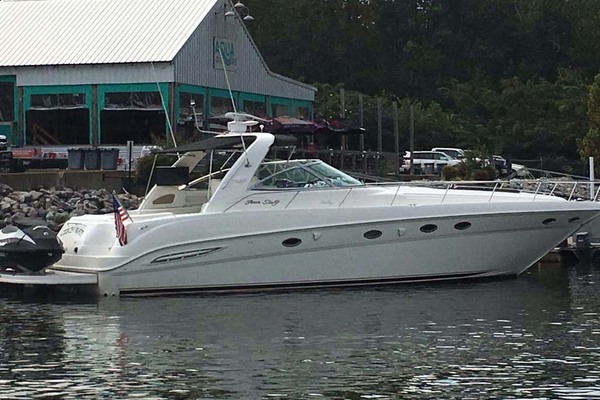 Perfectly well maintained Ferretti 460, same owner since new. Three cabins lay out. Try an offer! The Ferretti 460 is another superb product made by the Ferretti Engineering Division in cooperation with the Zuccon International Project studio. A top-of-the-range model in the Ferretti Yachts family, the 460, 14.35 metres in length, offers a perfect balance of size, performance and comfort. The first surprise strikes you immediately when you step aboard. The yacht gives the impression of being a far larger yacht. The spacious salon has a U-shaped sofa of clean design, with a central table that can be extended to transform the living area into a dining room. Furnishings are in pale oak, while detailing can be personalised, enhancing the contrasts between the various materials used, in terms of both appearance and functional efficiency. Accommodation consists of two central guest cabins, and a large master cabin in the foredeck. The flybridge was designed in order to provide a unique mode of enjoying the sea, together with one?s guests. The ship owner will appreciate the ample space both of the swimming platform and of the cockpit, for maximum freedom in the use of the yacht?s exteriors, and an optimum feel of the sea.